Math. Some of us love teaching it. Some of us hate it. The same is true for our students. But no matter how we feel about it, we have to teach math. And we all know that it's easier and more enjoyable for everyone if we can get our students excited about what they're learning. 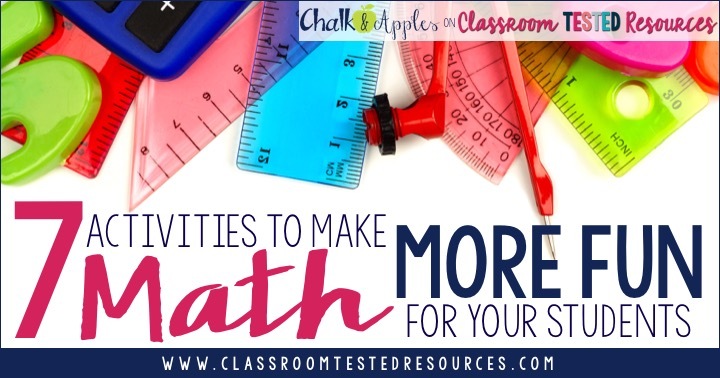 Fortunately, there are lots of ways to make math fun for even your toughest students. 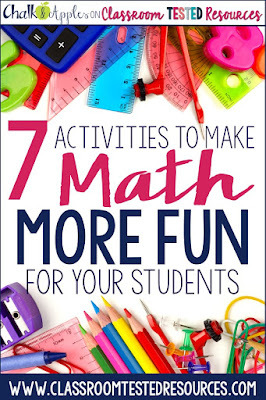 Today, I'm sharing some of my students' favorite math activities. Prodigy is a free adaptive math game that your students will LOVE! Common Core math skills (grades 1-7) are integrated into a role-playing game that will remind your students of Pokemon-style and wizarding games they might play at home. Students level up and become more powerful by completing math activities in their quest to defeat Crios, Prodigy's villain. The game includes hundreds of math skills, broken down by grade level. Teachers can allow the game to run itself, covering a variety of skills at the chosen grade level, or assign specific skills based on what you're currently teaching. A premium version is available, but it only offers additional level-ups, pets, etc. All of the educational content is accessible through the free version. Kahoot! is great for anything, but this year, my students need lots of help with their multiplication facts, so a few times a week, we practice with Kahoot! It's their favorite way to do math fact practice so far. Here's the multiplication facts game we're using to reinforce the 6s through 9s. You can click on the link to play without even creating an account. I've also written a blog post on my blog, Chalk & Apples, that will help you get started. You can check it out by clicking the image above. Math is so much more fun when you pull out a deck of playing cards! A few years back, I created a set of differentiated playing card games that covers lots of math topics. We use different games throughout the year, but the favorites are always the "war" style games, Target Number (which might remind you a little of blackjack!) and Flip Out. Since they're no prep games, these are great for centers or early finishers. I've also used them as homework games since many families have decks of cards at home. This is a great way to get parents and other family members involved! If you'd like this set of card games, you can grab it by clicking the image. Flocabulary is a paid subscription service with loads of great videos on all subjects, but they also have a YouTube channel with lots of free videos that my class loves. Multiplication.com has their own YouTube channel as well with animated math videos. Domino games are fun, and can work for most math concepts. Whether you're doing basic facts, matching geometric shapes to their names, or practicing math vocabulary, a domino game can work. Because the rules stay the same, you'll only need to teach them once, and can change the content by swapping in a new deck. These are perfect for centers, early finishers, and even homework games. My class loves domino games so much, I've started making more of them. Right now, we're playing with the multiplication facts deck, but I'll be swapping in division facts soon for some of my students. It's pretty easy to make your own set with index cards, but if you'd rather print & go, you can grab the ones I use in my TPT shop by clicking the image above. Can you add to this list? Leave your ideas in the comments. I'd love to hear how you make math fun in your classroom! 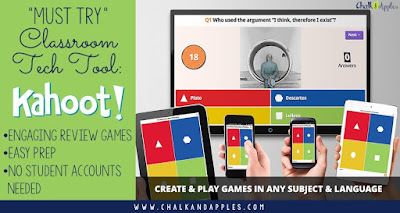 For more math ideas, visit my blog, Chalk & Apples, or check out my Pinterest board.